A new report examines this burgeoning group, their resources, and how they can better attain their goal of connecting with students and the community. Highlight key information for project ideas, such as standards alignment and educational setting, in some type of index, or other system, since many existing resources aren't geared to school-based educators. Provide research on the benefits of making in accessible formats, such as three to four-page summaries or white papers written for practitioners. That would enable educators to improve communication with their stakeholders. Continue to integrate opportunities to network with the platforms that maker educators are already using. These include Twitter, Facebook, Google+, and Google Hangouts. However, face-to-face interaction is also valuable to build trust and deep connections. Despite the logistical hurdles, 25 percent of survey respondents said they want more opportunities for in-person meetings with other makers in their area. To accomplish this research, Maker Education Initiative (Maker Ed), a nonprofit that helps facilitate meaningful making with kids, and nonprofit research institute SRI International (SRI) teamed up to explore the maker community and gauge resources they currently have access to, along with ones they’d like to incorporate in future projects. “Because we know that maker educators meet online and in person to share experiences and ideas, this study aimed to better understand how communities work for these professionals and whether their needs are being met,” explains Julie Remold, one of the study authors from SRI. One notable finding is that the concentration of maker settings is shifting away from museums and afternoon programs in after-school facilities to dedicated spaces in school buildings, where activities can take place throughout the day. 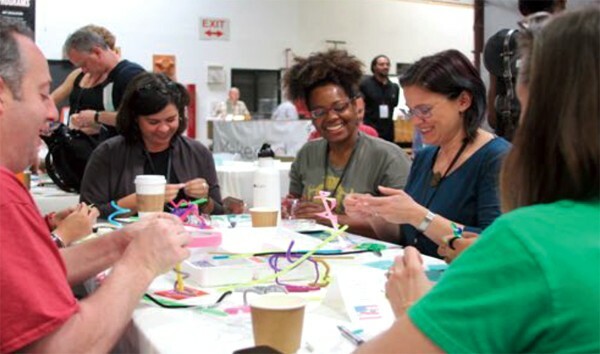 “Ten years ago, most maker spaces were located in drop-in spots or after-school programs, but when we reached out to the people doing this kind of work through Make Ed’s social media networks, many responded that they work in schools,” notes Jessica Parker, education community manager at Maker Ed. Remold, who’s been following the maker trend for years, was surprised by this finding. “I suspect the large number of survey respondents who work in school settings would have been far lower just two or three years ago,” she comments. Resources, which often go back to funding, can be hard to come by, whether in a school setting or public institution. “Funding for maker spaces is a big issue, but just by creating or designating a room where learners can come together is a great entry point for making,” says Parker. A large majority of respondents (84 percent) identified as white, and 66 percent were also women. They had two or three years of making experience, on average. Librarians interested in setting up a maker space or improving an existing one shouldn't try to figure out educational making by themselves, urges Remold. “There are thriving online and face-to-face communities of educators who voluntarily, enthusiastically, and generously share ideas and support newcomers interested in incorporating making into their instruction for the first time,” she reports. Jennifer Kelly Geddes is a Manhattan-based reporter who writes frequently for Parents.com and Care.com.